Ladies & Gentleman ... wanna win a 'Barry: The Complete First Season' on DVD from HBO? Barry (Hader) is a depressed, low-rent hitman from the Midwest who falls in love with acting while on a job in Los Angeles. Barry’s handler, Fuches (Stephen Root), hires Barry out to the deeply violent Chechen mob, led by Goran Pazar (Glenn Fleshler), and his right-hand man, NoHo Hank (Anthony Carrigan). Barry’s target is an aspiring actor who is having an affair with Pazar’s wife. When Barry follows his “mark” into an acting class taught by beloved teacher/guru Gene Cousineau (Henry Winkler), he is instantly drawn to the group of acting students, particularly Sally (Sarah Goldber). Barry wants to start a new life in this community of eager hopefuls, but his criminal past won’t let him walk away. Can he find a way to balance the two worlds? 'Barry: The Complete First Season' includes all eight “...smart, entertaining and funny” (TV Guide) episodes and comes with three insightful special features delving deeper into the world of Barry. Nominated for a total of 13 Emmy Awards, 'Barry: The Complete First Season' is executive produced by Hader and Emmy®nominee Alec Berg (Silicon Valley), with cast regulars also including Emmy nominee Henry Winkler (Royal Pains), Stephen Root (True Blood), Sarah Goldberg (Hindsight), Glenn Fleshler (True Detective), and Anthony Carrigan (Gotham). 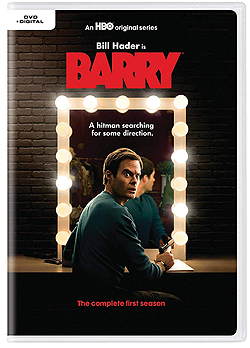 Enter now to win a 'Barry: The Complete First Season' on DVD from HBO by answering this easy question about the star himself, Bill Hader: Hader has mentioned, many times, that his very first job was selling ... what items?! Just fill out the form below and if you're one of the lucky ones chosen with the correct answer by January 15th, 2019, you'll win yourself a copy of 'Barry: The Complete First Season' on DVD from HBO. Which INTERVIEW in this new issue of ExclusiveMagazine.com has caught your eye ... and why? We always have signed music/movie/NBA memorabilia on offer. So, would you be interested to recieve a list of these items via email for you to possibly purchase?